A smashed window at a Canberra synagogue. Photos: Supplied by Executive Council of Australian Jewry. Verbal abuse in the street, rocks being thrown at windows, swastikas painted on synagogues and offensive phone calls are apparently all-too-common for the local Jewish community, as a recent report states anti-Semitic crime rates are continuing to rise in the nation’s capital. 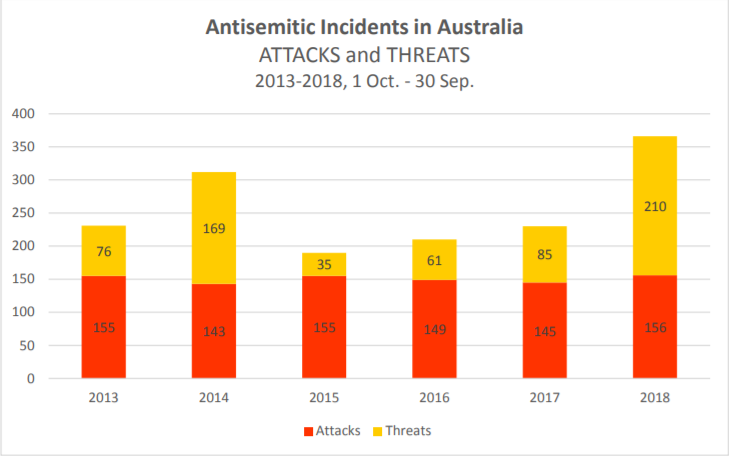 According to the Executive Council of Australian Jewry’s yearly report on anti-Semitism, the local Jewish community suffered more than a dozen attacks between October 2017 and September 2018. Anti-Semitic attacks have continued to rise in Canberra and nation-wide, with 366 anti-Semitic attacks reported across the country, a staggering 59 per cent increase since the previous 12 month period. Of the 366 nation-wide attacks, 13 were reported from the ACT. The highest number of anti-Semitic incidents were recorded in New South Wales (166), followed by Victoria (105), with the lowest tally recorded in Tasmania (4). 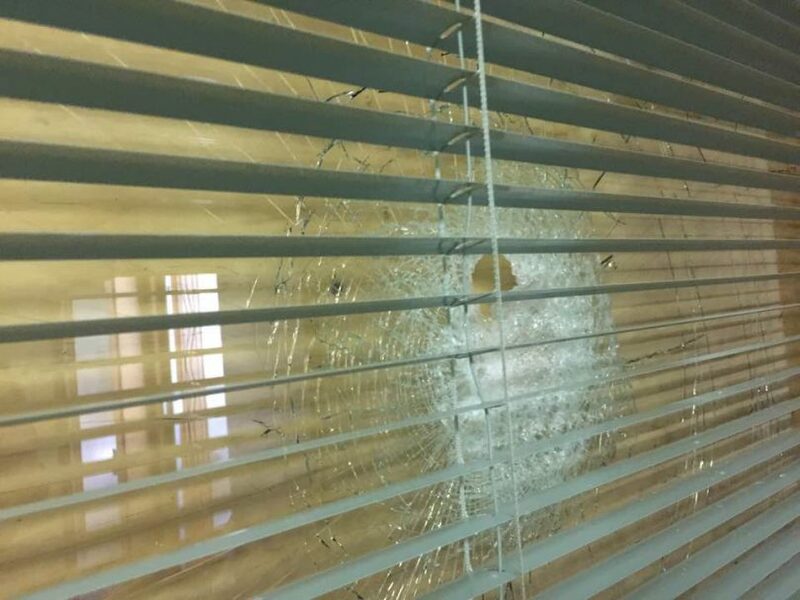 According to the report, a rabbi and his family were verbally abused and sworn at outside their Canberra home by several men driving by in a car, while in a separate incident, a rock was thrown through a window of a local synagogue last year. Other incidents in the past year include a rabbi’s home being vandalised and a spate of abusive phone calls to a synagogue over a three-week period and leaflets promoting anti-Semitism and white supremacy letterboxed in Canberra suburbs. Police are also investigating a vandalism attack on the Gan Yisroel Jewish Childcare and Community Centre in Giralang that occurred in May. Police released pixelated CCTV images of three suspects a month ago and said the investigation is ongoing. There are also reports that a local Jewish female teenager received vile and offensive messages over social media last weekend. An ACT Policing spokesperson said police are investigating the allegations. Federal Member for Eden-Monaro Mike Kelly has also been the victim of anti-Semitic attacks, with a package of pork products thrown at the door of his Queanbeyan office in September. The report – which was researched, written and compiled by Julie Nathan – said there had been increases in harassment, vandalism, and threats via email and telephone but a decrease in graffiti. “The rise in recorded incidents of verbal abuse, harassment and vandalism are especially concerning,” the report said. “Jews continue to be verbally abused and harassed around synagogues on a regular basis. An ACT Policing spokesperson said police take all allegations of harassment and vilification seriously. “In many cases, the pursuit of matters is dependent on information available at the time of the incident and a willingness of victims and witnesses to come forward,” the spokesperson said. Anyone with information about crimes of this nature or of specific incidents is encouraged to contact Crime Stoppers on 1800 333 000.